New York: Law firms in the United States and Canada are exploring possible consumer lawsuits against Research In Motion Ltd for last week’s BlackBerry outages, which for three days crippled email and messaging for tens of millions of users around the world. “Here, you just have the loss of (BlackBerry) use, so tons of class-action firms are not running to the courthouse steps," said Jay Edelson, a partner with the law firm Edelson McGuire in Chicago, who represents plaintiffs. “But there are definitely consumers motivated to lend their names to the case to make sure these problems don’t happen again in the future." A US Supreme Court consumer class-action ruling in April, in a case known as Concepcion vs AT&T, could also limit any BlackBerry outage lawsuits. The decision made it more difficult for consumers to sue if a contract they signed with a company demands that disputes be settled through arbitration on an individual basis. “One of the major battles in any lawsuit against RIM will be whether the claims against RIM are subject to the arbitration clauses," said Jonathan Tycko, a partner with Tycko & Zavareei in Washington who brings consumer class actions. “If they are, then that could make it quite difficult to bring a class action." “We may end up pursuing consumer-protection statute class-action cases in one or more states," said Mark Baumkel, a partner with law firm Baumkel & Associates in Bingham Farms, Michigan. “(But) given the very short time of the disruptions in service, the damages for consumers in each state may not add up to huge amounts of money." 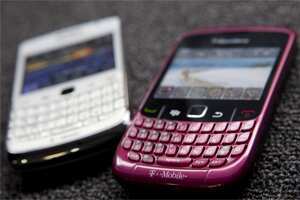 So far, RIM has not offered to compensate customers for the outages. The company said on Monday it would offer subscribers access to premium apps “as an expression of appreciation for their patience during the recent service disruptions." The apps will be available for four weeks and are worth more than $100 per customer, RIM said. The offer did not satisfy investors. RIM’s stock sank 6% on Monday following the news. “It would be very hard to prove actual damages from a failure of access to a smart phone," said David Logan, dean of Roger Williams University School of Law and an expert in mass tort litigation. “After all, for almost everybody there are alternative ways to communicate in a pinch." “Based on the investigation we’ve done, it looks like this is something RIM could have prevented," said Edelson. “They have not come clean about why the outage occurred or what new steps they have in place to prevent similar interruptions in the future."